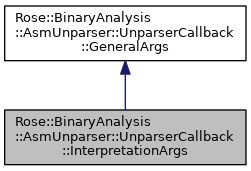 Arguments passed to interpretation unparsing callbacks. Definition at line 329 of file AsmUnparser.h. Return the node being unparsed. Definition at line 332 of file AsmUnparser.h. Definition at line 333 of file AsmUnparser.h.